So your tickets are booked and you’re counting down the days until you head off into the sun so it’s time to choose those a fail-safe selection of beauty products. With weight restrictions and not to mention all the shoes taking up your luggage space, some serious consideration needs to take place when choosing which products to take! 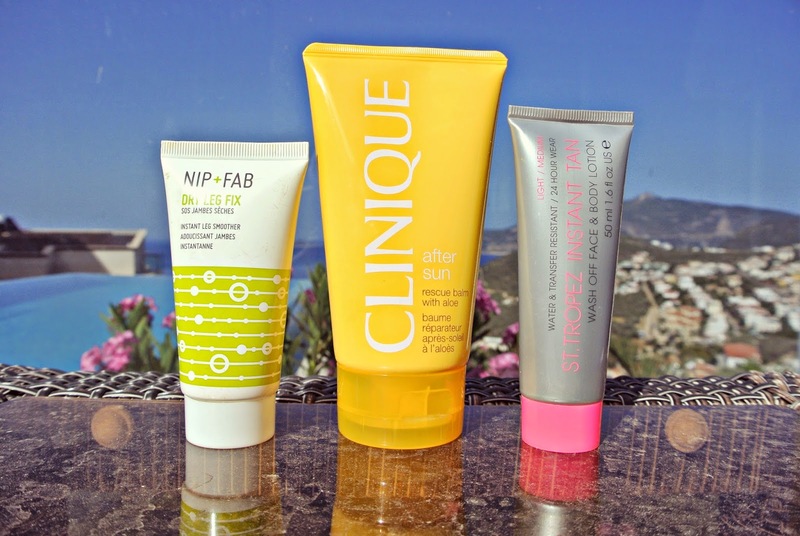 Here are three of my favourite fail-safe products for perfect pins for day & night. The first product that I always reach for is this handy sized tube of Nip + Fab Dry Leg Fix. It’s mini size makes it ideal for popping in both your hand luggage and your beach bag and the intense moisturisation that it provides keeps legs from drying out in the rays. The lotion contains an ingredient called Aquaxyl which helps your legs to retain moisture. The restructuring component improves water reserves in the skin (apparently) – usually i’m skeptical with claims like this but I have to say that I have noticed that my legs don’t feel so dry post-shaving and I avoided the dreaded scaly legs that sometimes comes after too much sun exposure! Secondly, it’s vital that you choose a really good aftersun lotion to repair your skin after sun exposure. I am in love with the Clinique’s After Sun Rescue Balm with Aloe Vera; it has a rich but quick absorbing formula which feels super luxurious to apply, leaving skin looking and feeling soft and healthy. If you’ve skipped on the SPF and are feeling a bit burnt, then this lotion can be a little painful to apply as it is a cream (as opposed to a spray) but I’d recommend applying a relatively thick layer and not rubbing in too much, allowing it to really sink in. The lotion has a refreshing cooling sensation which is just a dream on prickly skin! The formula replenishes and repairs damaged skin and sunburn and also prevents skin from peeling so you can prolong your tan. I used it on my face too and unlike many lotions, it doesn’t break you out in spots. A small amount of this goes a long way too – so you’ll only need one bottle for yourself and one other even if you are heading off for 2 weeks. For those first few nights when you want to rock a short skirt but your pins are still a little pasty, I recommend the St Tropez Instant Tan Face & Body Lotion. This is the best lotion I have tried when it comes to having slightly more dry skin after sun exposure, and you’ll be able to fool everyone into thinking the tan is natural as it lives up to its claims of a streak free, easy to apply tan. It gives an even, brightening glow to the whole body and I recommend applying with a mitt. The great thing about a wash off tan too means that the next morning, you can rinse it all away so that your skin is ready for tanning! As much as I love this product on holiday, it’s also a favourite of mine at home too – it’s so instant that you can quickly whizz some on if a last minute night out beckons! What are your essentials for perfect pins on holiday? Next Post Clarisonic Mia 2 Deep Pore Brush – Worth the price tag?